I'm probably going to get laughed at for this, but... I was wondering if it would be practical to supercharge the 3S-GE in an MR2 SW20? Thing is... I'm writing a fic, and would like to keep it semi-realistic. And I apologize if this the wrong section of the board. I don't see nothing wrong with it. They already have amazing handling with their 50:50 balance and adding a supercharge wouldn't be a bad a idea. It would make more sense to just swap a 3S-GTE. But if you were absolutely positively in love with the car or stuck with a loan and couldn't afford to buy something faster, I could see using it, if used engines still cost more than a supercharger kit (back when the car was brand new). There are supercharger kits for the Altezza that could theoretically be reworked to use with the 3S-GE. Assuming there is any room for them... which there probably isn't. There is almost zero room between the front of the engine and the wall of the engine bay where you would be adding an extra pulley. Actually, a bolt-on turbo would make slightly more sense for packaging reasons. But again, I will repeat this, supercharging an NA car when there was a turbo version available is a dumb idea. Well, I wasn't planning on doing it myself. I was going to write it into a fanfiction, and at the very least wanted to confirm the fact that it was possible. I at least want my facts correct if the writing tanks. Thanks for the response, either way. If you need/want some help with the fanfic as far as technicals go please feel free to shoot me a PM with your questions. id be glad to help out where I can if youre interested. sideways certainly knows his stuff. I'd take him up on his offer if I were you. And if you're gonna go with the 3S-GTE that Banken suggested (with good reason), then I think you'll want to go with either the GT or GT-S models of the SW20 if you haven't already (because those cars had that very engine in them to begin with). While a supercharged SW20 is pretty rare, there have been a couple of good ones. If you check out the MR2 Australia forums, particularly this thread by Mandalay, which shows his build of his SW20 with a 3SGE BEAMS motor and a Rotrex Supercharger. Mandalay's build is a brilliant work of art and makes the whole build look like a factory installation. Initially the car made 205.1RWKW, but with some changes and tweaks, it then went to 251RWKW. He is currently rebuilding the car with a bigger intercooler system, bigger supercharger and shooting for over 300RWKW. Now if your looking for information on MR2's, definately have a good look around about the AW11, SW20 and ZZW30's that have had the 1MZFE V6 3L motor or 2GRFE V6 3.5L motors dropped into them. A 2GR in an SW20 put it's on par with a NSX power wise, but is a lighter package and one example of a 1MZFE Twin Turbo (WTF Auto's SW20) produced 600+HP with an awesome power curve. Alrighty, I'll be sure to ask for help, thanks. Supercharge is nice if you're portraying a guy that likes to be out of the norm (like Wataru). You can add the benefit of the added weight of the SC at the back as a weakness (or strength... or both...). But if he's the typical run of the mill street racer guy, the 3SGTE might be more "realistic." I'm somewhat familiar with the MR2 and how it handles (and somewhat it's weaknesses). First of all I don't believe the 50:50 weight dist that people claim it to have. It's more of 40:60 I think (rear biased) or something close to that. And don't believe the whole it oversteers a lot and stuff. If you know what you're doing, it should be at the verge of understeering at the limit on a long sweeping corner. Though when it oversteers, you need to catch in immediately! It can only handle a certain drift angle before the oversteer is unsavable (On the stock turbo car at least). And don't believe the whole it oversteers a lot and stuff. I dunno how familiar you are (do you actually own one?) but this statement is silly. How tail-happy it is depends on a few factors, but Toyota wouldn't have bothered making a suspension geometry change in '93 if it didn't have a reproducible snap-oversteer problem. Yeah I race one :3. It's relatively stock though. 1998 Turbo so I have the updated cross member (Sometimes I wish I could try the older crossmember). And only mods are a Greddy side mount Intercooler, down pipe, and exhaust.... Well tires aren't stock, obviously, and I run 17s. Yeah that over steer is thing is over rated (when you know what you're doing). Mostly the oversteer comes from people who shift from FF to MR. 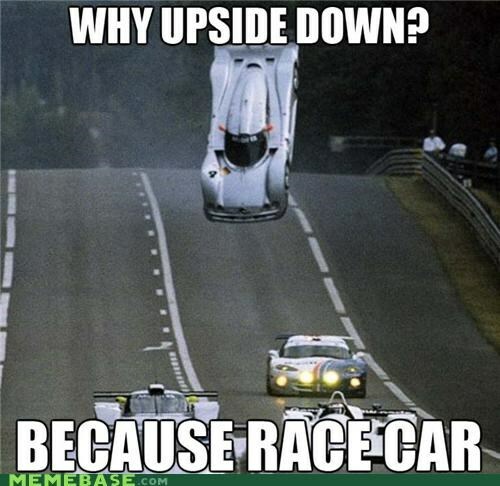 Since the front is really really light, understeer will come first. Then they add more steering lock and decrease throttle. Then when the front regains grip (and since they have more steering angle), boom, snap oversteer. Or sometimes when understeering bad, then lift off the throttle violently, then there, it will oversteer. I came from an FR so adapting was a bit easier. The same habits you do for an FR is really close to the habits you need for an MR. I'm used to using lift off oversteer to correct understeer than increasing more steering lock. I'm also used to power out Acceleration. But yeah... Once it does let go, and you reach a certain drift angle, it's unsavable . So you really need to catch it quickly before you get to that angle of no return. And yeah, when it does tail out... It is quite alarming. FR= Keeping the tail from overtaking the front with throttle control. MR= Keeping the front in front with steering since the rear has the mass, it will go where it wants to go. As a former MR owner, I totally agree with what Jhaqastar posted. The notion that MR2s oversteer at the drop of a hat is a huge misconception, and probably was made by somebody that never actually drove one. In theory, sure, it sort of looks like it would be tail happy. In reality, it's actually very easy to control the car and in most situations it will hug the ground like it's on rails. If the tail end does swing out, it's not difficult to tame, unless it's some sort of violent oversteer or you're on bad terrain (ice ice baby). The only time I ever lost control of my AW was during a blizzard when I was trying to get home, and got snaked by a traffic light change. I hit the brakes, upset the rear balance (due to poor traction), and ended up spinning through the intersection, stopping just a bit after reaching the other side facing the wrong way. I just put it in first gear, turned around and continued home, which was luckily only a few blocks away at that point. Oh, was this topic limited to the AW11 chassis? In that case the comment I made has no bearing. The snap oversteer issue was limited to the SW20 chassis and was corrected in '93 with a suspension geometry and tire change. As far as I know there's no such 'issue' with the AW11. EDIT: Oh wait, the OP says specifically SW20. That changes that then! I was just speaking of the MR2 in general. I've never driven an SW20 so I have no idea how it handles, but the AW and the early SW had similar setups, so I figured they would drive relatively the same. but the AW and the early SW had similar setups, so I figured they would drive relatively the same. Back when I asked you a bunch of questions about the MR layout, learned partway through that your AW barely had any lift-off oversteer to it (without even having any roll bars or the like to give it that sort of stability) and then started wondering what made AWs inherently so much more stable than early SWs despite having shorter wheelbases, you ended up giving an explanation that actually included differences in setups. You mentioned that AWs had a relatively low ride-height and in turn, relatively limited weight transfer, so the reason they were so stable was because even when the weight shifted onto the front wheels, it wouldn't easily take enough weight off the back wheels to make them start sliding out on their own. Meanwhile, early SWs not only didn't have the wider tires that came on later models, but also had a comparatively higher ride height that gave them comparatively greater weight transfer, so they were more likely to start oversteering since as well as being able to transfer more weight onto the front wheels with more ease, they also didn't have rear tires grippy enough to downplay the effects of that characteristic. As N1 mentioned, it was significant enough that Toyota revised the suspension and fitted on wider wheels for later models (something they never did for the AW). Certainly not all that difficult to control if you know what you're doing though. So yeah, the difference in ride height sounds like different setups to me. Am I remembering something wrong here? I want to get this cleared up before I end up doing something stupid with my own fic. The difference is in power. An NA AW11 is incredibly easy to drive because it has very low power. There's a lot of torque for such a light car, but that's it. The SW20 changed that with essentially the same setup but much more power to the rear wheels. I don't think ride height really had much to do with it. A lot of the issues people were reporting were coming from people that were not at all used to the uncommon MR setup in terms of control. In 93, they put longer toe links on the rear suspension and put wider tires in the back to reduce the chance of snap oversteer and calm down fears of drivers wrapping them around trees. In reality, what they did was stifle the "pure" feeling drivers got from the AW11 and pre-revision SW20. The revised toe settings and tires meant it was harder to make the car oversteer when you actually wanted to. What I am saying is that when driving the AW11 and pre-revision SW20, they feel the same, as it should be. The longer arms on the 93+ were there so that the toe changes were reduced when the suspension travels. The shorter arms produced more toe changes. One main difference with the AW11 and the SW20 is surely the weight. The SW20 is the heaviest of the MR2 line up. Plus having the heavier 2.0L+ engines at the back. But in effect, I think the SW20 has the highest potential when handling power (putting it to the ground) and is a little bit more stable on the bumps. But nothing would take away the raw pleasure of the AW11! I bet the AW11 was a more tail happy car. But since it was so raw and it transmitted data to the driver so well, catching or predicting the ovesteer wasn't to bad. I think they tried to replicate the AW11 winning handling characteristics to the SW20. But since the SW20 came out in the era of FWDs and cars that baby their drivers, the early SW20 were thought to be death traps (for people who don't know how to use em). So they dumbed it down for the everyday consumer with the longer tie rods at the back and wider tires. But yeah... Maybe the SW20 is sort of a death trap to people who just jumped into the realm of RWD coming from racing a FWD machine. But coming from an FR, The SW20 is really blowing my mind away as it is! And that's considering my FR is pretty heavily modified already to a stock MR2. That amount of rear traction is really really really amazing! On a FWD car, the 3SGTE (a friend of mine has a Corona with the 3SGTE), rolling in third at 1Krpm, with 235 tires (better brand than mine), then you floor it, once the boost starts kicking in, the torque steer is crazy! On the MR2, 1st gear, when it boosts, it launches you forward. Power shift to second, a little chirp, then rockets you forward, 3rd, it still rockets you forward. On a SR20DET Silvia (stock), in the rain, when you're in 1st, 1Krpm, then you floor it, when the boost kicks in, the tires will be spinning to the red line (and you'd be sideways a bit), Power shift into second and second gear will also bounce on the limiter without you going anywhere (other than sideways if you jerk the wheel). On the MR2 (it was still new to me back then), it was raining, and I felt a little playful. I ken that stock to stock, the 3SGTE is more powerful than the SR20DET. I was in first, and I was planning to bounce the revs on the limiter (letting the wheels spin). So I was rolling. I floored it. Here comes the boost! Boom! The tires spun a little, then it launched me forward. I was approaching the limiter fast (but the tires was gripping). I though if I power shift maybe I'll have the wheel spin that I wanted... Powershift. There we go! Some wheel spi- oh wait it's gripping again and the car in from of me is getting really close... Fuuuuuuuuuuuu! The rear grip is really amazing >.>... Call me blasphemous but I think this car can go toe to toe with AWDs at corner exits! Without the added AWD system weight! The only downside I think is that it does tend punish mistakes more than your regular car. Give the car to Itsuki or Iketani or even the lesser evo and FF drivers of Initial D and they might crash the thing when they carry their habits to it. But give to like Takumi, Bunta, Keysuke, Ryoske, Soichi, Sudo, etc etc and the SW20 will handle really well! Oh and the other downside to the MR2 is the engine bay space. It's so frikin hard to work on that thing. Some shops drop the whole engine just to change the clutch >.>... Maybe that's why it's not so famous with the racers . Our local shops charge me more when they work on my engine because it takes longer to do stuff. With an MR2, you don't pull the motor, you pull the car. And what a pain it is. On long sweepings it just wants to wash out. (Note this is not aimed at you, just the general reader who is less informed). Despite popular belief, mid/rear engine cars (engine behind the driver) tend to generally be very prone to bad understeer. And when you think about it- its pretty easy to understand why. One of the most generally-understood "strengths" of cars like this is their ability to lay down power coming out of a corner because theyve got the weight of the engine on top of the rear wheels adding traction. In comparison to the light front end, the front tires have relatively little force on them. This creates a rather drastic difference in the amount of traction between the front and rear tires. This makes it exceptionally easy in most cases for the rear wheels to lay down more power without slipping than what the front tires can handle causing them to wash out (slip), and the result is understeer. Their "dreaded characteristics" come from when you do something to make those rear tires lose traction (even if its uusuuaalllyy easier to make the fronts go first- this isnt always the case)- And the weight of that rear end wants to swing out like a hammer. Because of the amount of traction the rears tend to have when it does happen it happens abruptly, and it happens quickly. Nice nice, i should follow this thread closely! Because my first car is going to be a AW11 probably. Since we are talking about MR2, it that a good idea: a AW11 as first car?? ?